The Arctic Heat Pump is already the most energy efficient air source heat pump for cold climates on the market in North America. However, this is not the only reason that our heat pumps are industry leading for hydronic heating and cooling applications. 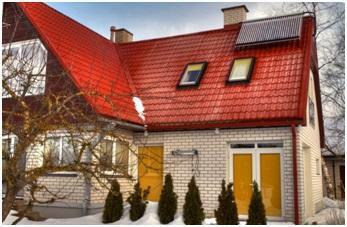 All our systems are designed to quickly integrate with a solar thermal heater. This can increase the overall efficiency and operating costs of your system by a further 20%. Solar Thermal is a perfect combination for use with an air source heat pump and can add an extra 47,000 BTU per day on average per collector. We use SunRain Solar Vacuum tube collectors as these vacuum tubes can deliver hot water to the system in the middle of the coldest North American winter. These collectors are regarded as the top technology in their field in North America and have a 10-year warranty. The efficiency of a solar vacuum tube allows it to produce energy even on cloudy days. The 80% efficiency rating for our solar thermal systems means that it captures and delivers 80% of the suns energy. Compare that to a solar PV panel at 13-16% efficiency, and it is easy to see why our solar thermal systems have been so successful even in areas with the lowest electricity costs in the world. 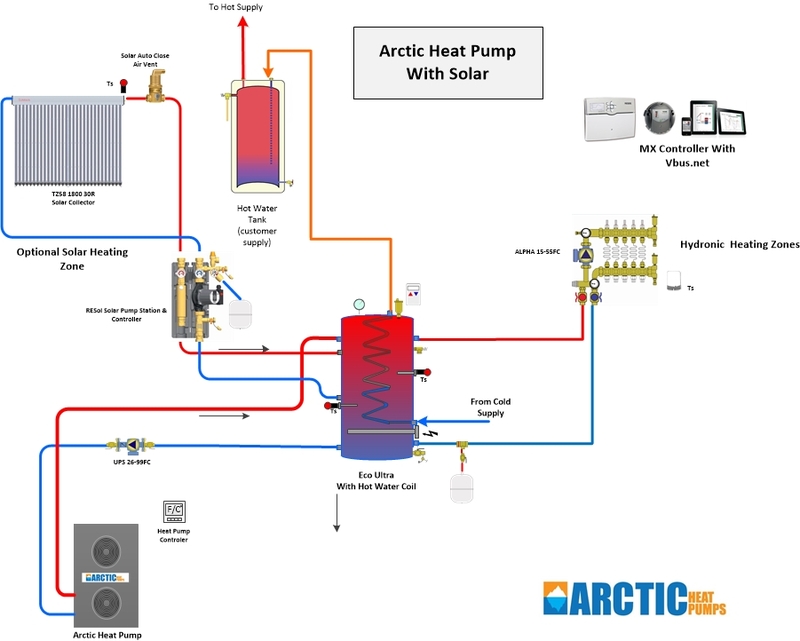 Below is an example diagram of a solar integrated heat pump chiller system. Not shown, in-floor hydronic heating can be used in place of or in addition to fan coils. Solar vacuum tubes use a heat pipe technology that transfers the sun’s energy to a heat bulb. This heat bulb can reach temperatures of 300 C. Each collector has 20 or 30 bulbs and are inserted into an insulated copper header that is a heat exchanger. The heat pipes transfer their heat energy to the header and to a special glycol heating fluid. Each header contains 2.2 Liters or .6 Gallons of heating fluid. Inserted into the header heat exchanger is a temperature sensor. A second temperature sensor is placed in the bottom of the Heat Pump buffer tank, and a differential controller with a pump unit senses both temperatures. When the heating fluid in the top of the collector exceeds the water temperature in the tank, the pump is activated, and the energy transfer begins. Hot heating fluid is circulated through the large heat exchanger located on the bottom of the tank. The energy is then transferred to the storage tank to be delivered to the rest of the home heating system. The integration with an air to water heat pump is an ideal combination for solar as they both share the same glycol heating fluid. 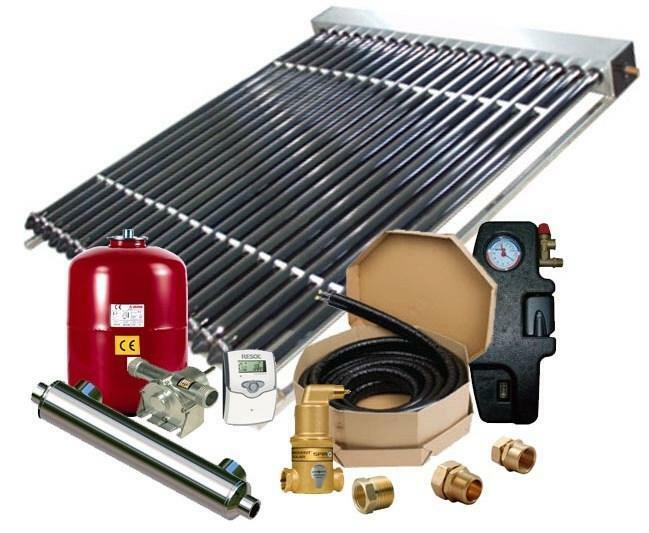 Unlike other air to air heat pumps, Hydronic heat pumps and solar thermal share the same principle of energy storage a thermal mass (buffer tank). Home owners that really want to cut energy cost should definitely consider the advantages of combining an air to water heat pump with solar thermal to increase the performance and reduce operating costs.